Successfully Added Mini Flashlight Set - 5x Mini Flashlight, CREE LED, 3 Light Modes, 350 Lumen, 14500 Battery, Aluminum Alloy, Telescopic Focus to your Shopping Cart. These mini LED flashlights are a great addition to any emergency toolbox. 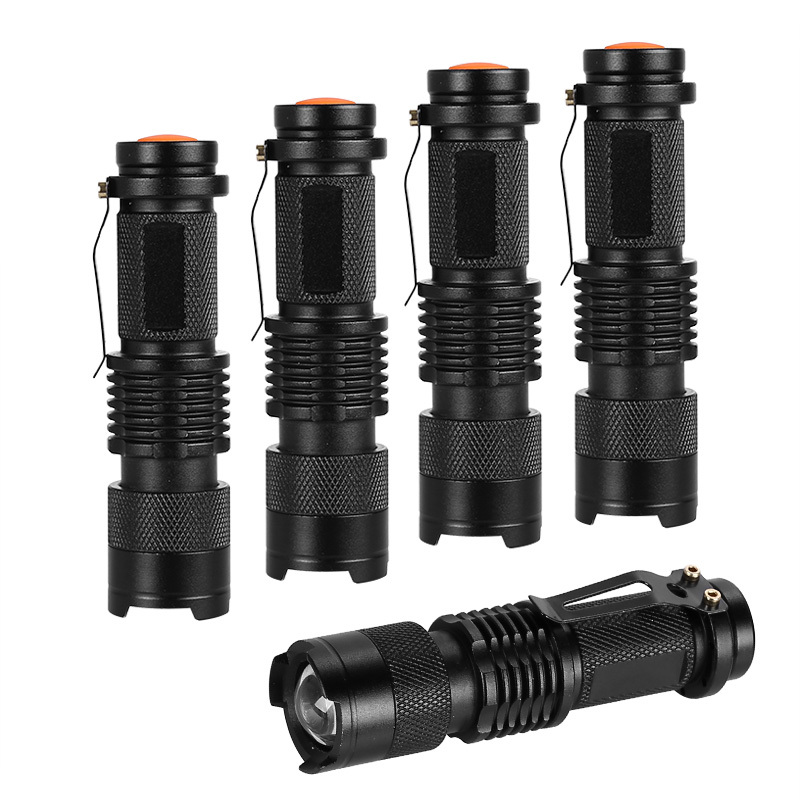 With their small and lightweight design, these CREE flashlights can be easily carried around inside your pocket. You’ll be treated to 5 high-standard pocket lights that can be used at home, outdoors, or in your car. With these flashlights at your side, you’ll never be left in the dark again. Each flashlight is powered by a 14500 battery and brings along hours’ worth of usage time. With their 3 lighting modes and telescopic focusing, these CREE LED flashlights are able to provide the right lighting in any situation. Each mini flashlight features a 7W LED that puts forth 350 lumens of bright light. This is more than enough to light up the way ahead in the darkest of environments. These LED flashlights come with a 12 months warranty, brought to you by the leader in electronic devices as well as wholesale electronic gadgets..
Arabic - مصباح LED الجيب; Chinese Simplified - 袖珍 LED 手电筒; Czech - Kapesní LED svítilna; Danish - LED-lommelygte; Dutch - LED zaklamp; French - Lampe de poche LED; German - Pocket-LED-Taschenlampe; Greek - LED φακό τσέπης; Hebrew - פנס LED כיס; Hindi - जेब एलईडी टॉर्च; Hungarian - LED zseblámpával; Italian - Torcia LED tascabile; Japanese - LED の懐中電灯ポケットします。; Korean - 소형 LED 손전등; Norwegian - Pocket LED lommelykt; Polish - Latarka kieszonkowa LED; Portuguese - Lanterna de bolso LED; Russian - Карманные Светодиодный фонарик; Spanish - Linterna de LED de bolsillo; Thai - ไฟฉายพกพา.